Woods and smoke, the ultimate pairing, in a curious blend. Smoky birch and dark gaiac, softened with cedarwood and the woodland scents of patchouli and moss. Inspired by haute parfumerie, these exquisite scents form Parks most luxurious fragrance collection. 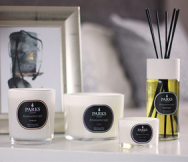 From Oudh Noir to exquisite blends such as Sandalwood & Ambergris, our Platinum collection is the candle perfected. Given carte blanche to select the finest ingredients from around the world, our perfumer has created truly memorable scents for the fragrance lovers home.